ColorVUE Enchanter is designed to take your beauty even further with subtle and clever enhancement of your eye color. Flow of fine lines towards the pupil renders a very natural appearance. 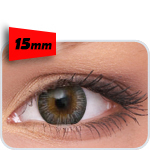 It's 15mm diameter gives slight iris enlargement and definition. Now your looks does matter with a pair of Enchanter.